Mitsubishi may not be known as an EV innovator here in the States, but the brand has a history of dabbling in small, electrically powered cars back in Japan. 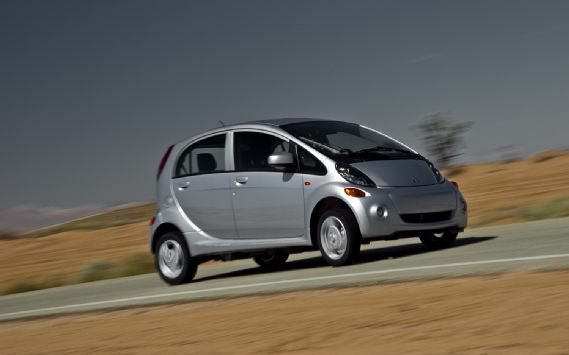 In 2009, the automaker rolled out the electrified version of its i micro car, called the i-MiEV, in its home market. A year later, the i-MiEV made it to Europe. Now, it's finally our turn, and Mitsubishi has simplified the name and blown up the car's proportions to suit American tastes. But even with the changes, is the U.S. ready for a small, underpowered, and range-limited EV? No matter which side of the fence you're on regarding the future of transportation, electric cars are here -- and it's our job to test them. So test the Mitsubishi i we did. Known here as the Mitsubishi i (powered by MiEV technology), the U.S.-spec version gets a stretched body that's 4.3 inches wider and 8 inches longer than its Japanese and European counterparts. To turn a standard, non-electrified i into an EV, an electric motor producing 66 hp and 145 lb-ft of torque replaces the gasoline engine above the rear axle, while a 16-kWh lithium-ion battery pack - the same one found in the Chevy Volt - resides beneath the floor, along with a motor control unit. A simple, single-speed direct-drive transmission sends power to the rear wheels. For range estimates, Mitsubishi chose to go with the EPA's measurement standard. As such, the i is rated at 62 miles to a charge, though the unadjusted range is 98 miles. While the basic ingredients of the i may not sound too different from the other all-electric offering in the U.S. market, the Nissan Leaf, how Mitsubishi carries out that recipe is where the differences lie. 2006 Mitsubishi Eclipse GT HELP! !